Chris Ewanouski and Carlos 455. 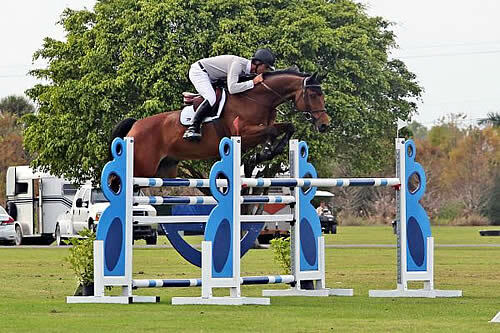 Wellington, FL – February 21, 2014 – Out of 50 contenders, Chris Ewanouski rode Carlos 455 to Wellington Turf Tour 1.40m Grand Prix victory at Deeridge Farms today. It came down to a difference of 2/10ths of a second, but Ewanouski set the standard high with his time of 33.367 seconds in an 18-horse jump off. Brazil’s Rodrigo Pessoa snatched second place aboard HH Let’s Fly, while Jeffery Welles rode to the third place with Antaris S.
Jeffery Welles and Bilion set the pace early this morning as only the second to take on Eric Hasbrouck’s course. They rode to a clear first round, and moved into the jump off where they tripped the timers at a speedy pace of 34.662 seconds. With another mount left in the class, and seeing a chance for possible defeat, Welles tried to catch his own time aboard Antaris S.
With blazing speed, he piloted the bay gelding through the turns with efficiency. They sliced the seconds with their strategy, stopping the clock at 33.783 seconds. His speedy times pushed him into the lead for the Leading Rider Bonus, fueling a fire as Sarah Segal later returned with Tilghman to reclaim her title. Segal piloted Tilghman to a double clear effort in 33.840 seconds to surpass Welles’ round with Bilion, but she could not quite catch the time he set with Antaris S at 33.783 seconds. Although a field of 40 competitors remained, each one tried, but could not catch Welles’ time, until Chris Ewanouski took the reins aboard Carlos 455. He was tenth in the jump off, but he knew that he has a tremendous feat ahead of him. Not only did he need to catch Welles’ time, but he needed to be just a tick faster to avoid the remaining riders from superseding his rank. Brazil’s Rodrigo Pessoa, coming off of yesterday’s win at the FTI Winter Equestrian Festival’s $125,000 Ruby et Violette WEF Challenge Cup, traversed the track with confidence and speed aboard the 15-year-old HH Let’s Fly. He rode double clear in 33.561 seconds, nearly catching Ewanouski’s time, but falling 2/10ths of a seconds shy. Ewanouski’s time did not hold the week before when competing at the International Polo Club Palm Beach, but this week he was ready to ride for the victory. Pessoa eventually earned the second place with Welles capturing third. Segal and Tilghman finished fourth, while Jeffery Welles and Bilion took fifth. Daniel Deusser and First Class Vaneeckelghem rounded out the top six. Week VIII of The Ridge at Wellington Turf Tour will be held at the International Polo Club Palm Beach. Get your entries in now for the 1.30m-1.35m Jumper classes, as well as the $15,000 Ridge at Wellington Grand Prix by clicking here. With Welles taking over the leading rider position, the competition is getting fierce as only four weeks remain to claim the one-year membership to the International Polo Club Palm Beach! Riders should get their entries in to avoid post-entry fees. The stakes are increasing each week as top riders, amateur and professional, vie for their invitation into the $24,750 Invitational Grand Prix Series Finale Saturday, March 22, 2014, and the newly announced Leading Rider Bonus.